The EU Withdrawal Bill will return to the House of Commons for a series of crunch votes on 12 June, it has been announced. The legislation suffered 15 defeats in the House of Lords, which will now be debated by MPs. Numbers are tight with the Tories needing the support of the Democratic Unionist Party for a majority. Conservative MPs have been told to be on site “at all times” during the day of the votes. The prime minister’s spokesman confirmed there were Lords amendments the government thinks are unacceptable and will be seeking to overturn. The legislation is a key part of the government’s strategy for leaving the EU following 2016’s vote in favour of Brexit. It involves transposing EU law into UK law to ensure a smooth transition on Brexit day. 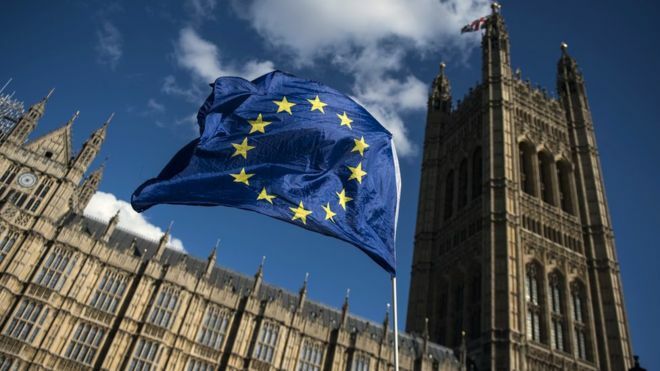 But peers have attempted to amend it in several areas, including the customs union, the Irish border and removing the precise date of Brexit – 29 March 2019 – from its wording. The amendments would also give a Parliament a potentially decisive say over Brexit and keep the EU Charter of Fundamental Rights in force in the UK. The votes will all take place on a single day in the House of Commons, Downing Street confirmed. On Twitter, the Labour Whips’ Office said holding all of the votes on one day was “an absolute disgrace” and “must be out of sheer panic”. The Commons “has had nothing to do for months in terms of substantive business and to try to ram through in one day shows the contempt that the government have for the role of Parliament”, it added.